Anchialine pools are threatened by many different problems. Do you know what they are? There are 4 main threats that the pools face. They are introduced species, nutrient overload, reduced fresh water and pollution. 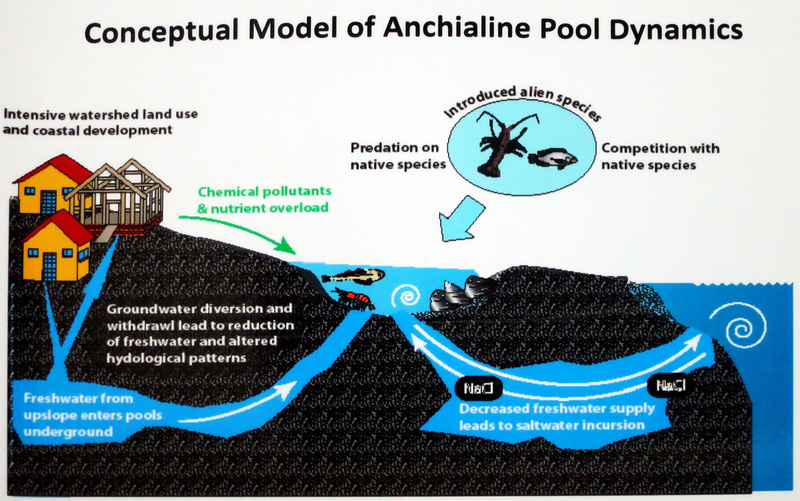 Some of Hawaii's anchialine pools have been destroyed by these threats. Introduced species are animals and plants put in the pools by humans. Many of these animals are not native to Hawaii. One common animal that is put in are tilapia. The tilapias are voracious eaters and eat everything. Many introduced species do not have predators in the anchialine pools. This alters the native food web by eliminating many native species by either eating or outcompeting with them for resources. A result of introduced species is nutrient overload. Nutrient overload is when there are too many nutrients in the water. An introduced species population will become very large without any predators to reduce it. The large number of introduced species eating everything in the pool creates a lot of poop. As the poop decomposes, nutrients are released into the water. When there are too many nutrients from the poop in the water, nutrient overload happens. All the extra nutrients in the water causes an algae bloom. An algae bloom is the green gooey stuff you sometimes see floating in the water. When that happens, it blocks sun light and oxygen from entering the water. If that keeps happening for too long, then everything will die. The creatures that die also add to the nutrient overload and will help the harmful algae to continue growing. Reduced fresh water is when there is less fresh water going into the anchialine ponds. Reduced fresh water can harm the pools because the water in the pools are brackish. Brackish water is a mix of fresh and salt water. When less fresh water goes in the pools the water become more salty. The saltier water can upset the animals and some may die because they are not used to living in very salty water. What causes this? When more people come they need more fresh water. 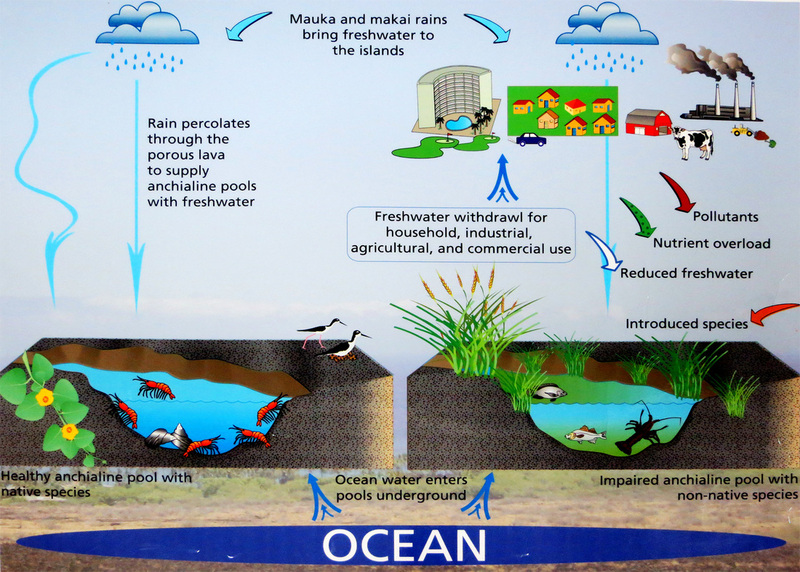 Most of the fresh water in Hawaii comes from ground water. This is the same water that goes into the anchialine pools. More fresh water is needed as the people increase. When more fresh water is pumped from the ground there is less fresh water that can go into the pools. Pollution is a substance or a thing that may harm the environment. One way that the pollution can get there is that a non-point source. A non-point source is water pollution affecting a body of water. What happens is that a non-point source leads in to the fresh and/or salty water; it may even lead in to the pools. All the waste comes from sources such as agriculture runoff, contaminated storm water and septic waste. Since the since the non-point source leads in to the two places the pools get there water from then the water in the pools become polluted too. All the pollution can do many things. There are two main things it can do. First, it affects the water by making it murky. Murky water is just like the algae bloom by not letting the sun get through the water. The second thing it can do is that the pollution may affect some food sources and animals. It can poison the animals and they will die.